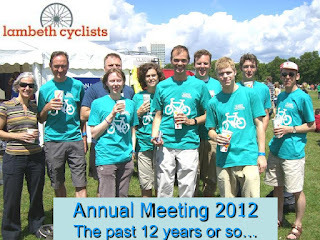 At our May annual meeting outgoing Lambeth Cyclists' Borough Coordinator Philip Loy reflected on his 12 years' involvement. With the help of a powerpoint presentation Philip outlined the changes since 2000 reflecting on the improvements for cyclists that have been seen with the establishment of Transport for London, initiatives such as the London Cycling Network, the bike hire scheme and Lambeth Council's innovative work to get more people cycling across the borough. The increases in the numbers of people cycling in Lambeth and across London show the success of these positive developments. Download his presentation for an insight into the progress made in cycling in Lambeth over the past 12 years.